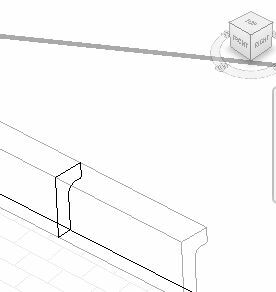 Once you have a Hardscape base (see Part 2), creating a curb in Revit is quite simple . There are a few ready-made tools that can be used to make curbs, such as Soffit, Facia, Gutter (in Roofs), and Slab Edge (in Floors). However, none of these tools will work on a sloping and curved edge. But these tools are simply a profile swept along an edge, which can also be done by simply modeling in-place. The Model-In Place tool is under Component, on the Architecture ribbon. When prompted to choose a Category, I use Floors, since a curb is associated with the Floor, but you can use any Category. You will also need to give it a name. It will then appear in the Project Browser, under the specified Category and name. Just like any Family / Component, it can then be renamed from here. Now you should be in the In-Place Editor. Choose Sweep and then Pick Path. Pick 3D Edges should be automatically activated. Now, simply pick the edge you want the curb to sweep along. This is easiest to do in a 3D view. Finish Edit Mode (green check). Next, the Profile. After Selecting the Profile, there are the typical Profile options: Load or Edit (by Sketch). If you don’t already have some curb Profiles, I would recommend making some. Here, I loaded 2 simple profiles. After selecting the curb and gutter profile, I needed to Flip the profile and Rotate it -90. This is the result (after pulling the Material parameter through, and applying concrete). Since it is an In-Place Component, it is somewhat independent of the Floor. If the Floor is deleted, the curb will remain. However (as a Reader pointed out down in the Comments), if the Floor is edited, the curb will adjust as soon as its Edit-In Place is clicked. 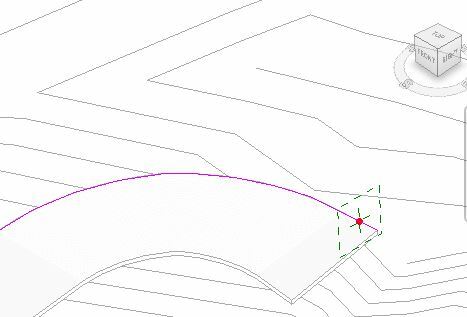 Also, the path is defined along the vertical edge of the floor, so the curb will also be vertical (it will not slope with the floor, as shown). If you want the curb to slope, this needs to be done within the profile. Finally, there are a few additional best-practices that you should always do, including setting the correct Function and Assembly Code parameters, as well as creating and assigning a Curb Subcategory. And you can always Calculate the Length of Curb for your cost estimate. Good stuff. Haven’t tried kerbs (curbs) yet. That is helpful to know, thanks! I haven’t had a chance to test out In-Place curbs much, yet. Thanks for commenting. This is fantastic! 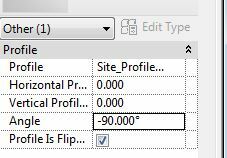 Have been struggling for this for quite some time, and have at some points resorted to manual “edit profile”, which does not work for curved walls and require a ton of manual calculations. So, thanks a billion for this post!